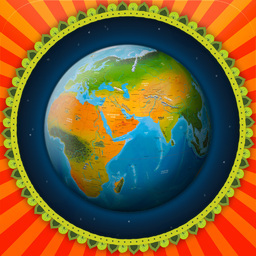 The Barefoot World Atlas, $4.99, is a great global education resource for both children and adults. At first, panning and zooming around a free spinning globe, reminiscent of exploring the planet via Google Earth, allows you to check out the countries. But because each part of the world is covered with animated images of cultural landmarks, occupations, activities, or anything for which a region is known, the Atlas beckons you to explore further. Upon doing so, you’ll surely get caught up in the plethora of facts that this chock-full-of-knowledge app contains. Tapping a country will give you a basic rundown of that country, including its currency, carbon emissions, flag, capital, and current weather conditions. The human brain has an innate instinct to explore further, and the Barefoot World Atlas takes full advantage of that. With a huge catalogue of factoids and information about each place on the face of the earth, you will surely find yourself tapping away at the next icon. It is truly unbelievable as to the amount of pure information that this app has to offer, and so simply attainable. Clicking on another icon will pull up a real image of whatever iconic thing you may be viewing, and all the text is (or can be if you so choose) be read out loud, so learning hard-to-pronouce ethnic names is simple too. The Barefoot World Atlas is one of the best reference and education apps that we at TheAppEmpire have come across, so if you have an extra Lincoln in your pocket, what better way than to cash it in on a deserving piece of technology. You too will become impressed at the information at your fingertips. An easy 10/10. Explore it all for yourself!